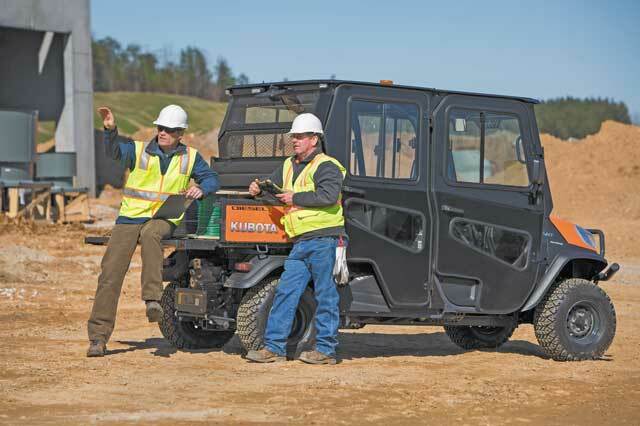 Utility vehicles (or UTVs for short) have become the perfect companions on the jobsite. 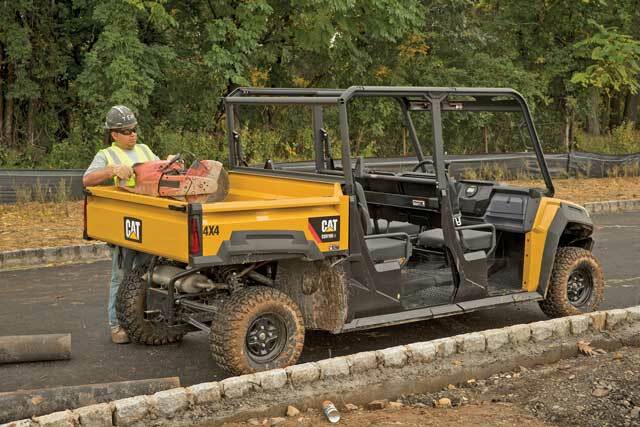 These small, but hard-working vehicles are packed with enough power and payload to tackle tough terrain and get crews and their tools where they need to go. Another perk? UTVs are cheaper than a pickup, and multi-row models offer extra room to haul even more people. 1. How much will you need to carry in the cargo box? 2. How many people do you want to carry? 3. What type of terrain will the vehicle need to navigate? 4. How fast do you want the vehicle to go? 5. What type of fuel do you want to use? Heading to a dealer equipped with the answers to those questions can help in finding the right UTV for your needs. Also keep comfort in mind, especially if you plan to carry multiple people. Check out the UTV’s seats, legroom and suspension. Fitch says that good suspension on a UTV can make a long day a little easier with a smooth ride, and low-travel suspension exaggerates each rut and ridge and can make off-road rides rough and even unbearable. As for price, a multi-row model costs around 10 to 15 percent more than a traditional single-row UTV. Kioti currently offers two multi-row options: the Mechron 2240 and K9 2240. In 1987, John Deere became the pioneer of the UTV category with the introduction of the five-wheeled AMT 600/622. Five years later, the first John Deere Gator models came to market with the Gator 4×2. Today, the company offers five multi-row UTV models in its extensive lineup, including three mid-size chassis models (the XUV560E S4, XUV590E S4 and XUV590M S4) and two full-size chassis units (the gas-powered XUV825M S4 and diesel-powered XUV855M S4). Polaris first entered the UTV market in 1998 with the introduction of its Ranger product line, and over the last 20 years the company has worked to continuously improve its vehicles’ power, payload and comfort. Currently, Polaris has one of the biggest collections of multi-row options. Kubota entered the UTV market in 2004 with its first RTV. Since then, the company has evolved its product line to include diesel, gas, general and worksite models. In 2014, Kubota expanded even further to offer the new RTV-X Series, which includes the multi-row RTV-X1140 full-size model. 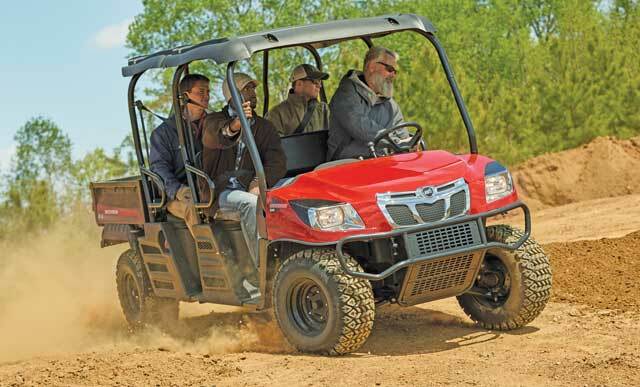 The RTV-X1140 is packed full of convenient features and powered by a 24.8-hp Kubota diesel engine. Kioti joined the UTV game in 2009 with the introduction of the Mechron 2200 and currently offers two multi-row options: the Mechron 2240 and K9 2240. The multi-row models offer plenty of power and maneuverability thanks to standard features such as four-wheel drive, three-cylinder Daedong engines and 12 in. of ground clearance. The 22-hp Mechron 2240’s cargo bed is more than 55 in. wide which allows for more than 650 lbs of bed capacity, and its two-row bench provides seating and seat belts for up to four passengers. Kioti’s K9 2240 offers even more room. Yanmar is a newer entrant in the UTV market. The company released its 2017 Bull Series line in August 2016, with the standard three-seat Bull model and the Longhorn edition with six individual seats. The multi-row Longhorn edition comes standard with four-wheel drive, a full body welded metal skid plate, a sun top and a thick rubber cargo bed mat. It also boasts a 700-cc class gas engine and is capable of pulling 1,500 lbs and hauling 600 lbs in the cargo bed box. Fitch also mentions that every Longhorn edition UTV gets additional storage options under the front seats, and the middle storage compartment is waterproof with a sealed lid. The Longhorn edition and Yanmar’s standard Bull model are both available through the company’s extensive dealer network. Equipment giant Caterpillar entered the UTV market early last year with the introduction of the gasoline-powered Cat CUV82 and diesel-powered CUV102 D. The company went on to expand its offerings in fall 2018 with five-seater versions — the Cat CUV85 (gas) and CUV105 D (diesel). Multi-row UTVs are a great and economical way to transport your crew and tools to and from the jobsite. Vincent continues to point out that the driver and passenger seats are all sewn for comfort as well as durability, and the driver’s seat position and steering wheel adjust to ensure a comfortable fit. 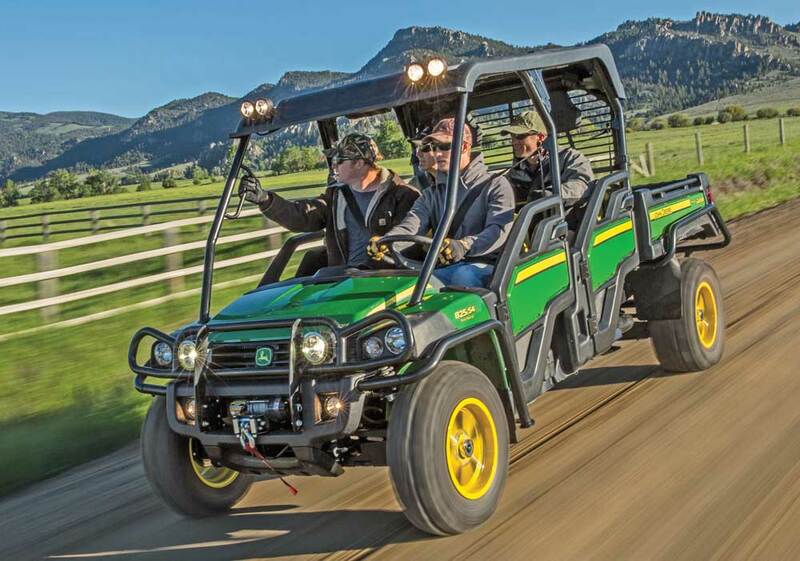 Outfitting a UTV with cabs, sunshades and windshields all add to the comfort of your crew. Did you know that buying a UTV is only half the fun? The other half is making the vehicle your own with different tools and accessories. Luckily, manufacturers and aftermarket specialists offer an abundance of products to make sure your UTV is outfitted to meet your needs and comfort level. Justin VanderHeyden, Gator product marketing manager at John Deere, agrees that protection options like a windshield are highly valuable, as well as brush guards, fender guards and rear bumpers. He says that speed limiting kits are also popular on jobsites, limiting the vehicle’s top speed to 25 mph. As for attachments, UTVs can be equipped with a variety of tools to help accomplish any job. These can include everything from augers and spreaders to snowblowers and brooms. VanderHeyden says front blades are extremely popular because they allow operators to move materials such as dirt or remove snow during the winter months. Roger Gifford, Kubota product marketing manager for utility vehicles, recommends that contractors consider a gear-box driven PTO and quick-attach system for their UTVs, which allow operators to switch from one attachment to another in a matter of seconds. Click on the link for even more cool UTVs.